Set somewhere around a year after the events of The Voyage of the Dawn Treader, Eustace Scrubb remains much better off for having had the experience. Back at the fairly dreadful school he’s attending in the real world, he encounters a crying classmate named Jill. In attempting to lift her spirits, he tells her about Narnia. And when bullying classmates come after her, he tries to help her flee. In the middle of their hiding efforts, they open a door and slip not away from their school, but into Narnia. There, a peculiar adventure awaits. Narnia is again in peril. King Caspian is nearing the end of his life, and his sole heir son has long been missing. Together with their comically dreary guide, Puddleglum, Eustace and Jill must set off on a quest to retrieve Prince Rilian. But only Jill received clear instructions from Aslan himself. And the harshness of their journey threatens to make her miss the signs she was so carefully taught to look for. Well-paced, rich in vocabulary, and rife with vivid imagery. Charming as ever, Mr. Lewis! I appreciated that there are a few invaluable message elements underlying the story itself. Concepts like, “Looks can be deceiving.” And how dangerously tempting it can be to believe what we wish to believe—particularly when we are weary. Potentially thought-provoking for young and older readers alike. 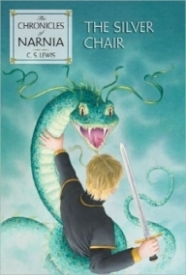 In this installment in the Chronicles of Narnia, we get to return to Narnia, only this time we go with Eustace and a school friend instead of Lucy and Edmund. The danger is real, the world is magical, and the stakes are high. Another fabulous adventure! The Silver Chair is a return to the roots of the series, the rescue from the worst. In the sixth installment, we see an old character, Eustace, and his schoolmate Jill Pole who are tormented by bullies. In escape from ridicule, they run into the end of their world and the beginning of Narnia. Led by directions from Aslan, they are sent to find the lost prince Rilian, the son of Caspian the Seafarer. They journey into the bowels of the earth and the land of the Giants on the search to rescue the prince from evil forces, reminscent of the ones facing the pevensies in the second book.